Combining comfort and style, the permanent bed mattresses boast the BULTEX® brand and high quality stretch fabric with braid trim (braid trim on the mattress or mattress topper). Slat beds provide natural ventilation for your mattress, extending its life and enabling better air circulation. The active slats mean the base can match your body movements and position on the mattress as you sleep. This ensures much greater comfort as your body is suspended. This mattress topper features foam that moulds to the shape of your body and returns to its original shape when you get up. It moulds effectively to your body when you sleep, creating an enveloping effect and gently absorbing movements. * Option for Series 6F, 8F and 80dF; EXECUTIVE PACK for Series 70F and DISTINCTION. 1 . Day side with style fabric, mattress skirt and bias binding. 2 . Night side with quilted stretch fabric on 50 kg/m3 SENSUS® viscoelastic foam. 3 . Total mattress thickness up to 155 mm. The living room bench seats feature high density, high resistance foam. The angled back combined with greater lower back support provide excellent lumbar support. All our models are fitted with special motorhome seats. In addition to being truly comfortable, they can also be set to your ideal position with adjustable back and seat height and angle. Designer yet practical, their ergonomic shape supports your slightest movement. technologies, so you can always find one to suit your needs. This heating system operates on gas and electricity (EH option). Air and water are heated using powerful electric resistance heating. Hot air is optimally circulated to the living area through several air vents. In all our models, this heating system is operated from the CP PLUS control panel, which features a digital display and programming options. The EH option means your heating can operate in gas, electric or combined mode. When your motorhome is parked, you can turn the heating on in electric mode to save gas. A-class motorhomes in Series 80dF and DISTINCTION feature a heating duct set into the bottom of the windscreen. Extremely effective at handling this cool zone, it acts as a barrier against the cold. Not compatible with the Webasto cab heating option. Using iNet, you can remotely control your heating system from your smartphone or tablet (depending on model). Diagrams and fittings differ depending on the model. Up to 31 convectors: equal to 31m of convector length ! 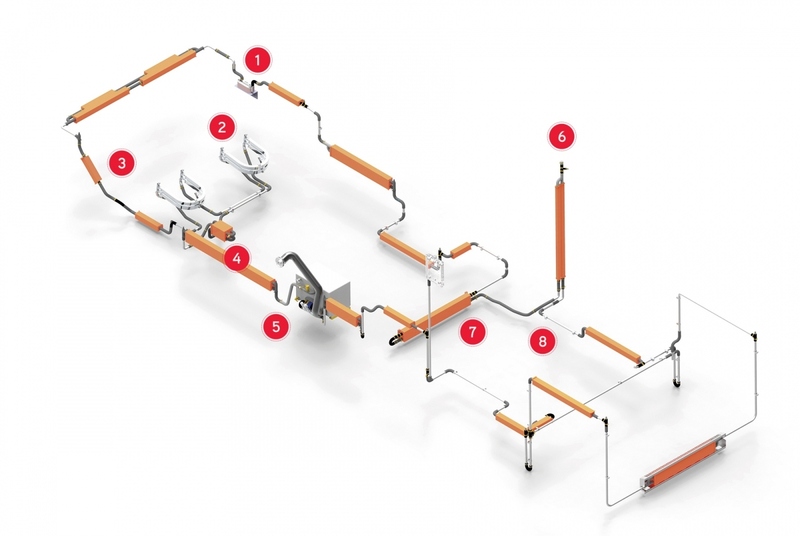 The gas boiler feeds a network of pipes and convectors to create a flow of warm air along the walls. The partitions, furniture and air are gradually heated, forming a barrier of warm air which insulates the windows. Working in collaboration with the ALDE team, RAPIDO has developed a top-of-therange central heating system that has been tested, with great success, in Scandinavia. RAPIDO ALDE’s high performance is the result of our continuous improvement programme, and the system regularly passes cold room tests. Temperature increase from -15°C to at least +20°C in under 4 hours with an external temperature of -15°C and delta of under 7°C between 5 measurement points.